Being what I consider to be in the mainstream of video games, I tend to, like everyone else, gravitate towards the most pronounced and name-branded games out on the market. Such franchises like Resident Evil and God of War have graced my consoles over the years. But once in a while I do find a game out there that many people have seemingly never heard about. and when that happens, I feel it my duty to share said gems to the world at large. such is that case with today's game, a game so obscure that not even fans of its source material know it exists. 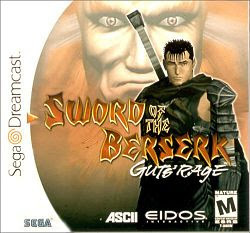 I'm talking about the Dreamcast Gem: Sword of the Berserk: Guts Rage. Sword of the Berserk is a video game based off of the popular Berserk manga series by Kentaro Miura, and stars a mysterious swordsman named Guts, who is accompanied by his love interest, Casca, and a tiny winged elf named Puck. If you're looking for any sort of backstory on any of these characters, You're gonna be sadly let down. See, this is one of the few problems I have with this game: The game's continuity takes place between issues of the manga, the very, very lengthy manga. In fact, the game takes place late in the manga's series. This means there's alot of backstory with these characters, as well as plot points in the game that tie into the previous manga issues, that sadly the game doesn't delve into at all. The three main characters just pop up into the main story and are given no real background say for a few throwaway lines by Puck. There are creatures such as a giant demonic gargoyle and a demon knight that pop up in the game that I think are supposed to mean something, but without any context, their appearances just leave you scratching you head as to what they matter to the overall game story. Even the main FMV that starts the game up just describes Guts sword, the Dragonslayer. We know nothing about Dragonslayer, or the tattoo on Guts's neck that seems to react around danger or something, or why Casca, one of the main characters, seems to be suffering from a condition that makes her mute and child-like in mentality., or where in God's name did this wise-cracking elf thing come from. The only saving grace is that the main story of the game itself is pretty procedural. It's its own thing independent from the main series, save for these tiny book-ends that link the two issues. There's a glossary you unlock after beating the game that tells you all the details behind everything in the game, but by then why even bother. at that point its just homework. Now, onto the main story, which has Guts entering a small castle town ravaged by a mysterious plant called the Mandragora, which has the effect of turning people infected by it into mindless zombies. Guts is asked by the town ruler, Balzac (stop giggling) to help procure the heart of one of these creatures in order to make a cure, and in exchange he will cure Casca of her mental condition. Guts agree and starts on a journey to a neighboring village to find a Mandragoran heart and cure is love. along the way you meet up with other characters including the leader of a resistance against Balzac, where Guts learns that not everything Balzac said was the whole truth. The story even throws in the question of the nature of good and evil with the Mandragorans, and what their true nature is, that elevates it past just your standard action filler. The story is somewhat predictable, but is told well enough that it doesn't feel trite. Speaking of story telling, there's the production, which is what really to me stands out the most in this game. The publishers of this game was Eidos via their Crystal Dynamics label, and it shows. Its obvious that the team behind the Legacy of Kain series had a hand in production because the game has that exact same level of movie-quality production that their other series has. The voice acting is top notch, and really one of the standouts of the game. Even Legacy of Kain alumnus Micheal Bell (Raziel) lends his voice as Guts. Cutscenes are shot like they were right out of a movie studio. Remember folks, this is 1999, and very few games at this point were reaching those levels of production, save for Metal Gear Solid. So seeing production this clean and high in a game is something to remark on. As are the graphics of the game, which really show what the Dreamcast could offer. In my previous Dreamcast review (Dead or Alive 2) I mentioned that that game and Soul Calibur really set the bar high for what the Dreamcast could do. This game really in terms of scope goes just as close. Areas are fully realized as opposed to the locked off levels of those fighting games, characters are solid-rendered (no cut pieces) and alot of the details are rendered out as opposed to painted on textures (although even those are top notch). the biggest stand-out in my mind are the faces, which were fully rendered and animated. Remember folks, 1999, so most games out on the market would cut corners in that regard and paint faces onto flat surfaces. To see fully rendered and animated faces on the main characters really lends alot to their performances. Sound design is done by Susumu Hirasawa, the composer from the Berserk anime, so if you are a fan of the anime, the score is lifted right from it. As for the gameplay, I would hesitate to say that the gameplay was really ahead of its time. As stated, this came out in 1999. The PS2 was not out yet, and so we had yet to play games like Onimusha and Devil May Cry, which in my opinion set the standard for hack and slashers of that era. So to play a game that is essentially a precursor to those really is remarkable considering how little people apparently played this game. Essentially you go around hacking and slashing up enemies left and right. You have several tools at your disposal, including a rapid fire crossbow, bombs, and ninja throwing arrows. Control-wise you have the ability to hack with a quick vertical strike, or a much slower yet more effective horizontal slash. You also have a dodge and block feature, as well as a melee attack without your sword. But the main feature, and the namesake of the game itself, is Guts' Rage, where after filling up a bloodlust meter (its not really called that, but its what I like to call it) you enter an invincibility-mode that not only turns the screen blood red but also powers up your strikes to the point of being able to completely dismember your enemies with a single strike (which is not that over the top considering your normal strikes cause geysers of blood to flow from enemies) Gameplay-wise the game really stands up, albeit except for two gameplay quirks that might rear their ugly heads all too much. First, alot of the game's combat takes place in tight indoor corridors and alleyways. The problem with this is that game developer Yukes (yes the same company behind the WWE games) programmed a stun lock when you strike hard surfaces with your sword, i.e. walls. this means in battle its really easy to hit the walls and get stun locked while your enemies wale on you, especially considering how big your sword is. This means you are better off using your melee attack, which is powerfully weak and bad against groups of enemies. You have no idea how many times I have died trying to fend off a group of soldiers in a hallway because I wasn't able to use my crowd clearing horizontal slash out of fear of stun lock. Another issue is the lack of a lock-on or targeting feature. Maybe this is just a new school mindset, but I find in the heat of battle completely losing my positioning after dodging around and getting attacked from behind. this is especially the case in boss battles. Its not as game-breaking as the stun lock, but its worth mentioning. So at the end of the day, is the game worth your time? Honestly, I would give it a shot. There arent many non-arcade Dreamcast titles that really stand out among the pack, and this one really brings alot to the table. Amazing production values boost a game whose gameplay is a bit rough, but satisfying. Who knows, maybe you'll enjoy the game enough to go out and read the manga or watch the anime. It's a win-win all around.